Due to the popularity of the first custom dress shirt and trunk show, 9tailors and Guilded Boston will host another event on June 27. If you missed the last one, you can still have a chance to get a great fitting shirt by 9tailors! The best part? Dress shirts start at $60.00. RSVP at info@9tailors.com…. As many of you know, we recently partnered up with a suit-making company, Evolution of Style. So, they set up “The Fit Test” to see if our shirts actually stand up to the off-the-rack designer labels . I don’t really need to say anything, as you can see for yourself the results of the test…. Here’s a sneak peak at our women’s custom dress shirts Dress shirts start at $60.00 for cotton-polyester and $90 for 100% premium cotton. If you want to order your own women’s custom dress shirt, contact a 9tailors Stylist at info@9tailors.com at 877.513.1898. To purchase a gift card, please click here. Mothers can call a 9tailors Stylist to redeem their gift card or to order their own custom dress shirt. E-mail us at customerservice@9tailors.com for more information. It’s another Testimonial Tuesday over here at the 9tailors blog. Here’s what another happy customer had to say: Thanks Corey! We’re so happy that we could deliver exactly what you wanted. Do you want to be as happy as Corey? Go to 9tailors.com or simply contact us at customerservice@9tailors.com. 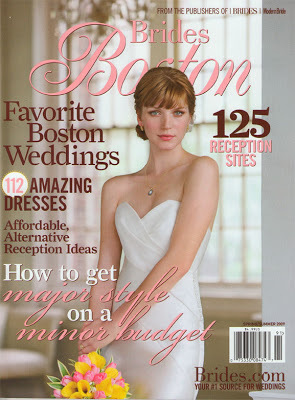 Our friends over at Boston Brides have mentioned us in their Spring/Summer 2009 issue! It is such an honor to be mentioned in this very lovely wedding resource. Pick up your issue today. Check out page 180. Need grooms and groomsmen style advice? Contact a wedding specialist at weddings@9tailors.com.